Message asking me to download new version at the App Store, but store indicates I have the latest version, when I try and then re-displays the error message. Thanks to an app “upgrade” I can no longer read Barron’s on my iPad. I can’t even read it using Safari on my iPad, because the website makes me download the app — which doesn’t work! This has been ongoing for about four weeks. Agree completely with the other reviewers that this app seems to bet progressively worse each time. One would think that you can keep it simple and allow readers to enjoy the reading rather than trying to make it fancy and keep introducing new bugs. The latest bug? It keeps telling me to update to the latest app, and yet there are no more updates. I am in an endless loop having tried all possible resets and clearing the cache. Barron's seems to have more glitches than WSJ and NY Times. I was not able to get he app to work this evening. 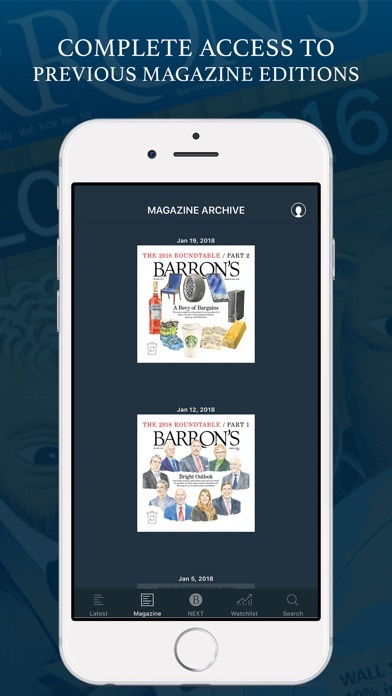 The new upgraded Barron's app will not work with older iPads (#2) because the older iPad iOS cannot be upgraded above 9.3.5 and the new app requires at least 10.0. Barron's needs to come up with work around. The app constantly prompts you to log in. Upon doing so, if you navigate back to the subscriber only article, you are prevented from viewing it unless you are logged in! The figure in the upper right corner shows you are logged in even as you get the same message that the article is for subscribers only! Useless. Will be canceling my subscription. You can get the app for free which is great. But In Order to read an article you have to pay 14.99$ a month. Just make people pay 14.99$ a month for the app. Business ethics people. As you read articles, you get rudely interrupted by their pop up marketing videos. When you pay for service, l don’t want to be interrupted by your sales marketing. If I wanted to watch advertisements I’ll turn on the television. Fix it and stop the pop up advertisements. Readers should have the option on whether they want to watch a stupid advertisement or not. The advertisement shouldn’t be forced upon them. The experience is completely broken because of ads. The ads will auto play full screen so often that I can’t even finish reading a single article before getting frustrated. Wait I thought a paid subscription would prevent these?? I use the Barron’s app on my iPad a lot, and on the iPhone some; either way, it just no longer functions properly. Recently, articles have begun to appear without any text; that makes it tough to read. And charts! Any diagram, table or chart cannot be expanded or rotated, rendering it either (a) just a smudge on the screen, or (b) massive 120-pt type where two words fill the screen. I just renewed my subscription, but if I have to read it on a desktop computer, I’ll reconsider; I’m increasingly using my mobile devices. Very often the story does not show when I click to read. Tried reloading, reinstall, updates, nothing works! Please fix the issue. When you click on some link or stock quote and then try to go back to the main article, you are ALWAYS brought back to the top of the article. I waste so much time just scrolling and scrolling. Also, clicking on a table to magnify it opens it but with half the rows blacked out and completely unreadable. Please fix ASAP! Update: Does not show stories now. Only titles. The website is way better. Not sure what happened to this App. It us to work great and now it locks up all the time. Half the time the links to other stories don’t work and when you try to enlarge charts and graphs they are distorted and unreadable. Please fix the App, it has been terrible for months now and I cannot take it any longer!!! The articles are the main show here and are great. Very informative and valuable. However, the app needs some work. I get random slowdowns where I can’t scroll down the article. If you exit the app to respond to a message and return, you lose your spot in the article. Extremely frustrating. Barron’s content is top notch, and a pleasure to read each week. That is, assuming you can actually read it given the continuous problems with the iOS app, and the extremely ineffective and ineffectual responses one receives from the tech support. All you receive is generic catch-all responses that clearly indicates tech support is not taking queries seriously or adequately researching the problem. Totally unacceptable from a subscription costing over $200 a year. Clunky interface. Hard to keep track of where you are in reading the magazine. Ads all over the place that do not download well further reducing the apps usefulness. Does anyone at Barrons actually read the magazine using the app? How can Barrons not fix these obvious issues? Links don’t open properly and I can’t see articles. Have tried reinstall. Can’t even figure out how to reach tech support. Despite paying a premium subscription price to access the magazine, the app cripples itself by presenting distracting, full-color, moving ads alongside every swath of black and white text. The effect is wildly distracting, and will make the app unusable for a portion of its users. Disgusting. Online? Nope. In app? Nope. By phone? During working hours. Ha. Check terms of service. Have account number? Thought so. Phone number on account? No. Don’t fall for first month free trap. When you click on some link or stock quote and then try to go back to the main article, you are ALWAYS brought back to the top of the article. I waste so much time just scrolling and scrolling. Also, clicking on a table to magnify it opens it but with half the rows blacked out and completely unreadable. Please fix ASAP! Prior to this latest app update, I could download and read an entire issue - in fact several issues - on the plane. Loved that feature as it allowed me to catch up with recent stories I’d missed. This new app requires an active internet connection, so I can no longer read on a long flight. Please restore the app to its previous functionality. 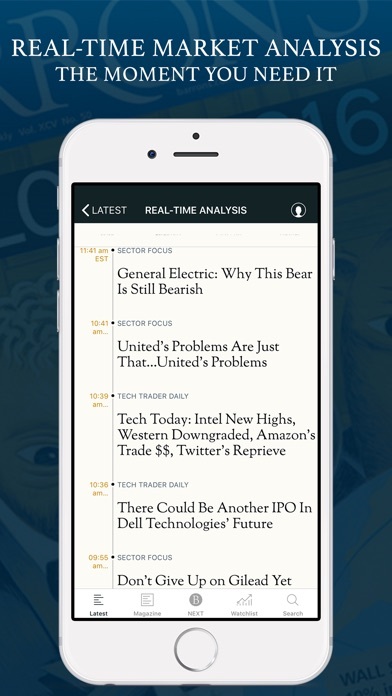 Note: the Wall Street Journal app still supports offline reading. 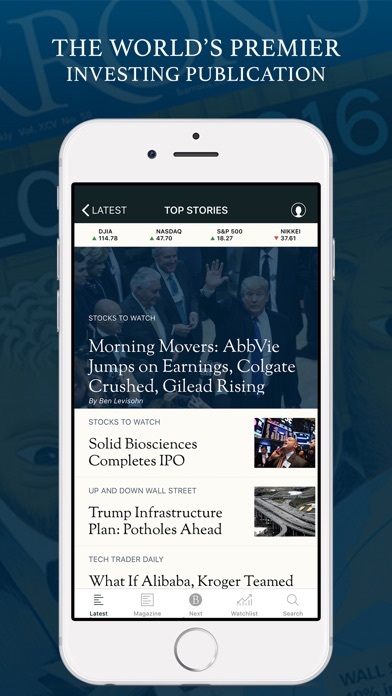 Barron’s and WSJ apps used to work identically. In this case, newer is not better. It seems that Barron’s feels that the well working app from a year ago needed to be “modernized” and thus broken. The sterile looking top stories section, now infused with ads, detracts from the excellent content. Get rid of the black! Expanding a graphic on an iPad is now unreadable. Any white background area becomes black rendering all text unviewable and unreadable. What used to be an enjoyable experience has now become irritating. Tied with the ridiculous price increase, not worth continuing my subscription. Please fix the behavior where articles scroll back to the top if you change apps or accidentally start to swipe left or right. That’s amateur hour programming, c’mon guys, learn to cache. 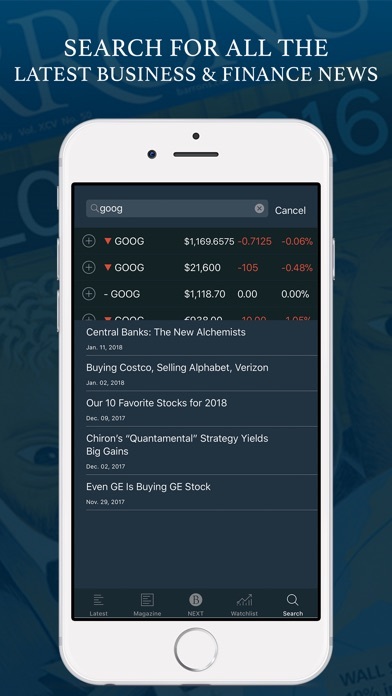 This app used to be great, but now I can’t search for articles by ticker name anymore. Any article I try to bring up says error could not load page. I read Barron’s and WSJ on the iPad. Recently, if I am mid article and let the iPad go to sleep or I lock it and then I reopen the iPad and Barron’s/WSJ app, the the same article comes up but it is reset to show the beginning of the article. So you have to scroll back to where you left off. The apps used to save your spot in the article whenever you locked and then unlocked your iPad. Basically a pain in the neck since I read these papers and their articles off and on throughout the days. I have been a Barron’s subscriber for many years. Unfortunately they have started putting very intrusive ads in the middle of the story. The ads are very distracting and make the articles unreadable. I’m ready to cancel my subscription if they don’t stop the intrusive ads. Does not work offline like it used to. Automatically takes out of current magazine and moves to on line scrolling stories. The stock watchlist is inconsistent when I am trying to add ticker symbols. At times, I attempt to add a ticker symbol and all you get is “unable to create try again later” or no ticker symbols show up regardless of what company I enter into the field “no market data results”. Please fix this as it happens on both my iPad and iPhone X.
Yep. What the title says. Enough said. I just upgraded to the latest version (3/8/2018) and while the platform improvements are sort of OK (swipe right to next feature instead of clicking an arrow being the best) there is...once again...a major flaw in the embedding of photos. Clicking on any image to enlarge it will show a large image..that is totally pixelated/out of focus! This had been an issue with the app from day one, but mercifully seemed to have been solved for the past year or so...but it's back! Whatever is resizing the thumbnail image seems to be simply making a lower rez jpeg bigger instead of loading a higher rez image! But at least to close the enlarged photo you no longer have to touch the image to get a 'done' button...maybe next revision you can simply use a swipe down motion to get back to the main page (like the WSJ and NYT apps)??? The new app has all of the same info, but bombards you with pop up ads as you scroll through articles. They block the entire page and have auto play animations. Very annoying. Does not work offline. I give up. The new update is so bad I am considering canceling subscription altogether. How can they issue something so erratic? The app is significantly slower to load stories after the latest app refresh. It is also arguably less attractive after the revised color scheme and font change. It was very easy to read and attractive in the prior version, it now looks worse. Great content, not so great design. Constantly crashes! Thinking about cancelling. Barron’s was much better years ago. NEVER SUBSCRIBE because is almost impossible to UNSUBSCRIBE!!! The App downloads and the bugs out when you try to use it. Tried it several times. Once even got to log in but even after logging in it failed. Love the great content. Consistent week to week. App needs improvement with regards to navigation. i love the content of barrons. i noticed the price went up to 19.99 a month on my cc so i went to the app to check my subscription. i could not find what i paid nor a way to cancel. i emailed customer service and they said the only way to cancel was to call a number. i called a number and they offered to lower the price! thats like a used car salesman. i grunted that they should have the subscription data and cancel service on the app. they said i still had $16 unrefundable. really tacky! just be careful when you subscribe digitally as they are like a bad used car salesman. I am a relatively new reader, and find the articles very informative and insightful. For as long as I continue to self-manage my stock portfolio, I will consider reading Barron's cover to cover very important. It's a trusted source of great information. New App is terrible. Crashes all the time. Unable to download articles for reading on plane w/o WiFi. Still no night mode. Just awful. Much slower as well. I use the app in my iPad and it seems geared to just deliver up the magazine, not the breaking news. It also sometimes just shows a blank page page if I am following a link from the alert on my screen. After frustrating interactions I usually give up on the app and just go to the main page via a browser. Skip the app, it’s not worth the pixels it’s painted with. I wish we could access more issues in the archive. Beyond that, love the scrolling is now vertical. The last update turned this from two thumbs up to one thumb down. Why, why why! Stop messing with stuff that works! Now it looks like any other junky web page... vertical scrolling, crummy layout. Bah! I want so badly to revert to the old app, right now... It was so good before. I should have taken the black icon as a clue to stay away! Am having a similar problem that I trace back to the acquisition of a new iPad. Access was never an issue with my older iPad but with my new one, I am unable to read full articles. I keep being asked to sign in and when I do, I am either denied or am asked to signed in again. Circular. Tech confines that I am a subscriber, and I continue to receive the paper hard copy but otherwise, Tech support has been anything but helpful. Don’t use the app - I had subscribed to Barron’s via iTunes for a trial period; unsubscribing doesn’t work. Something is broke here. Barron’s refused to refund their over reach. New app update is horrible. Very hard to navigate, buggy, finding stories challenging, previewing stories non-existent. What were they thinking? I might now need to go back to reading actual paper edition!! Just going to give some advice if you decide to cancel you can only do so through iTunes, go to iTunes, account settings, subscriptions, click on Barron’s, then if you choose click on cancel. Barron’s was not clear on this process so wanted to give a heads up to any who subscribed and was lost as I was. Incredible market insights. Thank you! Clunky. Buggy, and almost unusable. The markets had a most interesting week and I can’t even access my weekly December 22 magazine. I’m not sure I will renew my subscription and if I am the management at Barrons I’d be downright embarrassed. Took 3 tries to download. And never could log in. Gave up and deleted it. Will just use the Web site. The new upgraded Barron's app will not work with older iPads (#2) because the older iPad iOS cannot be upgraded above 9.3.5 and the new app requires at least 10.0. Barron's needs to come up with work around. After nearly 6 months Barron's has ignored numerous request to correct the situation. It is the only app where this has happened. My fear is that when Dow Jones also upgrades the WSJ it will happen there too. Another example of traditional media blowing it. Please revise so that older iPads can access the Barron's app. Inexcusable that app does not automatically update to latest issue for days after paper hits newsstands! Can’t believe that it won’t work on an older ipad. I have made a great deal of money trading Barron’s recommendations. If they are long on a stock I short it and if Barron’s is negative on a security I go Long. It has been a wining strategy for several years. A tremendous resource. This version of Barrons prevents the user from selecting a single word to get a dictionary definition. You are permitted only to select one paragraph. Select All is also not allowed. 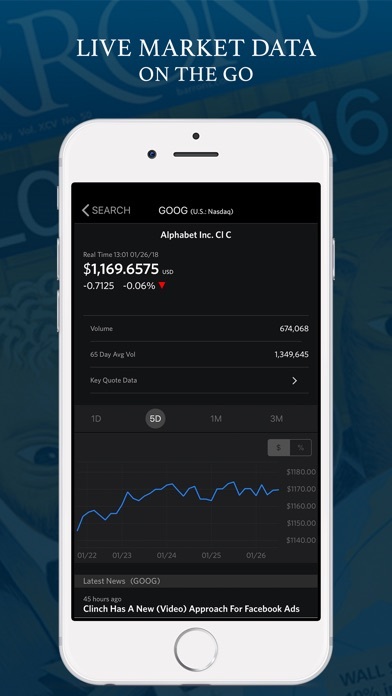 Maybe to better protect Dow Jones' intellectual property the app could be redesigned to present all text as a graphic, with screenshot disabled, and the screen darkened if a nearby smartphone lens is detected. Don't want to buy a new iPad! Barron's will not work on pre OS 10 iPads. Why? All my other subscriptions will and I refuse to buy a new iPad just to satisfy one app. Real-time analysis in the app is great.. Application dies on occasion. Pages reload automatically for no reason and you lose your spot. Advertising is intrusive, especially considering that we're paying for a subscription. I just turn off network connection to not be bothered by ads but then you lose stock quotes, etc. iPad version freezes when iPad wakes up after sleeping and have to force quit the app. If you, like me, live in the business world of investing, it’s practically impossible to imagine life without Barron’s. A few times each year Barron’s misses Saturday delivery and arrives on a hollowing Monday or Tuesday. These are bad weekends indeed and encourage a movement for the abolition of holidays for those who deliver the mail. Richard Hoe. If you can get it. Home delivery is horrible. Unless I purchase a new IPad I can't read it. Not equitable. Concise, up to date and timely. Every article now has 1 or 2 video ads within the articles that are not only distracting, but literally make me motion sick. This is a recent change. I liked the app better before the change. Barron's has maintained its place atop the list in a crowded field. Timely AND thoughtful. Barron’s has a poor interface when you compare it to it’s company family peers the Wall Street Journal. You can’t even take a close up at the cover of the weekly print edition. I’m sure most subscribers would agree this interface can be greatly improved. If you only care about readers with the latest ipad then you are fine. But if you want to retain the maximum # of eyeballs then your app should be able to differentiate between ipads that have the latest ios and those that don't. The app store will not allow me to upgrade Barron's since my ipad can't use the latest IOS. So i cant read Barron's? What happened to concerns about universal access? Please fix or I can cancel my subscription. Suddenly Barron's is not a part of my weekly Sunday morning ritual. and details when needed. I love the magazine and use it to teach my 16 year old on financial management. He is starting to show good grasp as he says Barron’s is enjoyable in terms of writing style. Keep it up! I like the way the app loads and updates quickly. Articles and in depth and timely. I would highly recommend the Barron's app even better than the paper that only arrives once a week. Not even taking full use of new iPhone X screen. Showing black band on top and bottom is pretty lame. I’ve been using the iPad app for several weeks without any problem. Today was very different. Many articles only had titles with the rest of the page blank. I sent a message to Barron’s through the app and then received 6 emails from tech support 2 minutes apart that said they would respond soon. The eventual response told me to click on a few things within the app to fix the issue. Those things are not even in the iPad app. Apparently tech was using an out of date app or they are just crazy. I sent another email to them stating the problems with their solution and again received a barrage of irrelevant emails. The tech support is totally worthless and the problem with empty blank pages persists both on the iPad and the iPhone. The web site works perfectly. One star for really bad tech support. I’ve never seen such poor support from any company. You say apples they say oranges. Perhaps they should bring the support back to the Unites States from the Philippines. A true must have for the serious investor. My I-Pad will NOT ALLOW me to download new version...Has Barron's a fix for this or are we an insignificant blip in the Big Plan ? As a Financial Advisor it’s my job to stay current and abreast of the latest financial news. Barron’s provides up to date concise and relevant news. Not user friendly! It keeps asking for security question, navigation is not intuitive, frustrating to use. The best research available to the general public. Worth every penny. I’ve been a subscriber for over 3years, and have seen this app get worse over time. The most apparent and frustrating bug now is that when you’re reading an article, the app will intermittently scroll you back to the top. And you lose your reading spot. PLEASE FIX!! Older iPad? No Barron's for YOU! Those of us with iPads not capable of running iOS 10 can no longer even use prior compatible versions as of now. The old app tells us to download the "new and enhanced" version but we cannot because the App Store says it requires iOS 10. And the older version, while still downloadable, simply tells us to upgrade. I've never had this happen with ANY other app. It is find to not support older iOS apps but not fine to just cut off those of us who don't get the latest hardware every year. Let us use the old version unsupported! My six year old iPad 3 works fine with iOS 9 for everything I want to do .... Except read Barron's. Disappointed. maybe the website will still work. Why don’t you have an iPhone X version? What is your Dev department doing? You don’t have to go and redesign the entire app all you have to do is make slight changes to the UI to make it compatible for iPhone X. It’s been 6 months since your last update. It’s 2017 it’s ridiculous when a company like News Corp can’t push periodic updates to the app. Higher more devs! We are in a new age keep up with the times. People pay a good amount for the subscription please be respectful of that. I’m not a big fan of not being able to turn the pages digitally as with the last version. I’m actually considering canceling my subscription. I can’t find what I’ve been reading for years and I’m just done with Barron’s. Why does this app keep breaking down? This and WSJ are the most frustrating apps that I have. Very disappointing!